Hi! My name is Valerie and I started riding my own bike in 2004 at the age of 41. I had always wanted to learn how to ride, but never had the chance until after I was on my own after a divorce. I first bought a Honda 500 off of ebay and taught myself everything I needed to learn from where all the controls were to actually starting the bike. I applied for my motorcycle permit and soon I was cruising short distances by myself. Shortly after learning to ride I met my husband...he was out on his bike with a group of buddies for a Sunday cruise and we happened to stop at the same bar for a bite to eat before returning home. It was fate that we met, because both of us had doubts about stopping in the first place. Luckily we did and we ended up closing the place down that evening. After that we went on many rides together with me following his tail light on my little Honda ... until one day he pulled over unexpectedly and said "It's time you learn to ride a Harley." He was riding his 1995 Springer. I was petrified that I would drop his pride and joy right in the middle of the road. But I got on and took it for a short spin up the road and back. He said I looked so good on that bike that he decided to buy another Harley for himself and my Honda was parked in the garage. 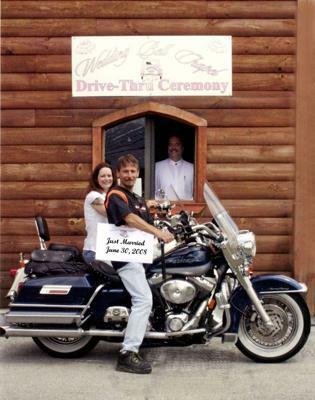 Shortly after that I bought my own Harley -- a 2001 Fatboy and still ride it today. We have gone on many bike trips over the past few years ... ranging from 100 miles to over 1200 roundtrip. We've trailered to Sturgis to ride the Black Hills, went to Virginia Beach several times, got married on our bikes in Pigeon Forge, TN and afterwards rode the Tail of the Dragon, Cherohola Skyway, and Blue Ridge Parkway. We have so many good memories from our adventures on the road and I can't think of anyone I'd rather follow than him. Hey Ladies, at 55, turning 56 in September, I took the safety course April 2nd, 3rd, and 4th and passed the driving test. On Friday April the 13th, passed the written test, missed one. Bought my first bike the following Tues, a 2006 Suzuki GZ250. My good neighbors, husband and wife both ride. Mike drove me up to Valley Srpings CA to bring her home the following Friday. I have only put a little over 200 miles on her. She only had 1,3000 when I bought her. I Luv Luv riding and will never be on the back again. Boy friends with bikes came and went, and I was left missing the mutal connections we had made together. Now I am meeting and making my own friendships on my bike. I have a very close BFF who has been riding for almost three years and really incouraged me to get my license. Her husband doesn't ride and she has been on her own. Now we are planning trips every weekend. Her daughters think it is great and all my friends have been very supportive and proud of me. My brother is all for it. This is a great site and I have enjoyed reading about everyone's experiences. Have fun and stay safe out there. I just started riding. My husband rides and has for years. We just had our 6th wedding anniversary and my present to him was for me to learn how to ride. He was so excited. He's always wanted me to, but I was too scared. I took a motorcycle riding course over the last weekend and now have my license! My husband bought me a used Honda Rebel to start out on and found a very nice used Suzuki S50 which will be my big girl bike. I had so much fun learning how to ride. It has really been a wonderful experience so far. I can't wait to get some miles under my belt. Great stories. I got into riding because of my hubby too almost 2 years ago. I started on a Ninja 250 and now ride a Vulcan 900. I wouldn't trade the joy of riding for anything in the world!! Love both of these stories! Hey Valerie, I too just learned to ride a few years ago, I've always wanted to ride my very own motorcycle, I started out with a Honda Rebel 250, my husband has ridden all his life, so he taught me everything I needed to know, he was extremely patient with me, of course he's always very patient, unlike me! lol! But soon I was on my way, riding around town, and feeling free! 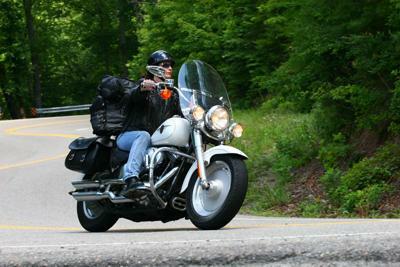 Eventually I moved up to a Yamaha 750, sold my Rebel, and now am so happy with what I have, my husband rides a Honda Goldwing 1100, so we go on rides every now and then, there's nothing like the feeling of freedom on the road! And I too, follow my hubby while we're riding, I'd follow him anywhere!